Oleg Saxophone Enhancers improve the ergonomics and ease of playing for most professional vintage and contemporary saxophones. These jewelry-quality enhancers are easily clipped on or attached with screws and wrench (included). 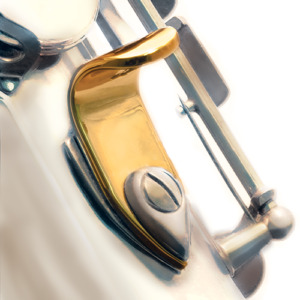 The Metal Thumb Rest attaches to your instrument without making any permanent damage or alteration. Designed to fit all makes & models of alto, tenor, and baritone saxophones.